Pampanga, Philippines — Every Holy Week , all roads lead to this town north of Metro Manila to witness the Philippine’s long tradition of “Semana Santa” or Holy Week. Aside from native food which Pampanga is well known for, the province is also popular for its Holy Week’s sacred practices such as Cenaculo, where last remaining days of Jesus Christ prior to His crucifixion is being performed by Kapangpangans with colorful costumes and their ‘award-winning acting.’ Another tradition is the non-stop 24 hours “Pabasa ng Passion,” a chanting and re-telling the passion, death and resurrection of Jesus. I know that there is a variation of this “Pabasa ng Passion” which they called “Pasyon Seranata” where there are two sets of singers chanting the same “Pabasa” but being accompanied by a band. They alternately chant like “sagutan” between the two sets of devotees. These are just some of the traditions that are being passed from one generation to another generation. The most unusual tradition that I witnessed was their yearly Flagellations and Crucifixion. 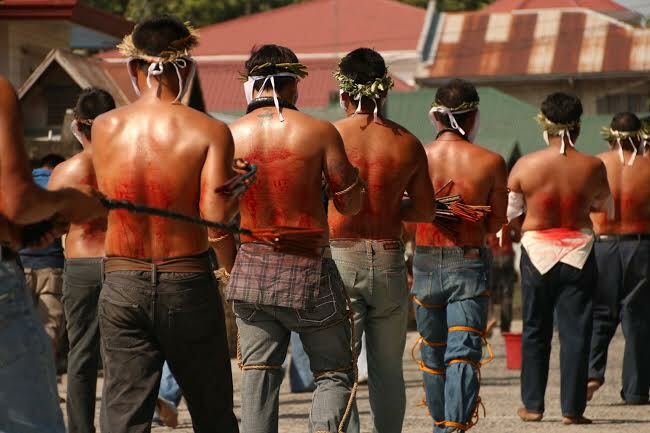 Flagellation is a procession of hooded or masked “penitents” walking barefoot and whipping their backs with wooden rods sometimes carrying a wooden cross or log while somebody whips them. Another one is “Crucifixion” where “penitents” are literally nailed to the cross. 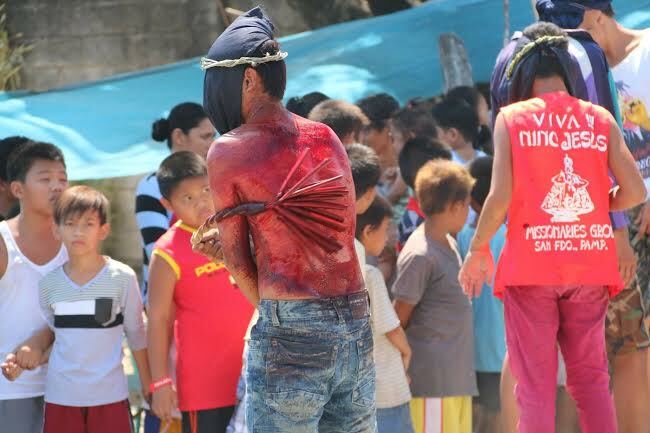 Generations of Filipinos say that these bloody traditions show their repentance although these acts are not wholeheartedly supported by the Catholic Church. I decided to travel to Pampanga to witness these so-called holy acts. We reached the town of San Basilio around 8:30 a.m. of Good Friday with my brother Noel and my sister-in- law Rowena along with their children Philip and Tin Tin. When we got there, we saw a procession of five masked male penitents along the road. They were dressed in red and some baring their upper bodies either carried a wooden cross or doing their self-flagellation. San Basilio is a municipality of Santa Rita which is approximately 80 kilometers from the capital city of Manila. There were 40 to 50 penitents gathered in their recreational area praying and meditating while they themselves whip their backs for about 20 to 30 minutes to ensure it will turn red as sign of inflammation until it turned numb. I thought I saw spurts of blood come out during their self-flagellation. For blood to come out, flagellants would have to create minor cuts on their back by hitting it twice on different places using a wooden mallet with blade on its surface, with the assistance of one of their elders. One could sense the pain as we saw how they clenched their fists every time the blades touched their back and warm blood exuded. After this initial ritual, prayers were uttered by all penitents prior to their parade. First to parade were the penitents carrying wooden crosses. Each of them walked barefoot under the burning heat of the noonday sun while doing self-flagellation. Blood continued to spurt from their backs to the extent that it had tainted roads, side doors of parked car, walls and fences of some houses and clothes of those who watched the procession. It seemed they never felt the pains. In an interview with TheFILAMLA, a former penitent Norberto Dizon, 57, said he has performed this ritual for 20 years. It’s difficult for others to fully understand why people do it, he added. For him, this is one way to show his divine faith to God, a way for a spiritual cleansing not only for himself but also for his loved ones. He believes the ritual must be passed to the next generation. 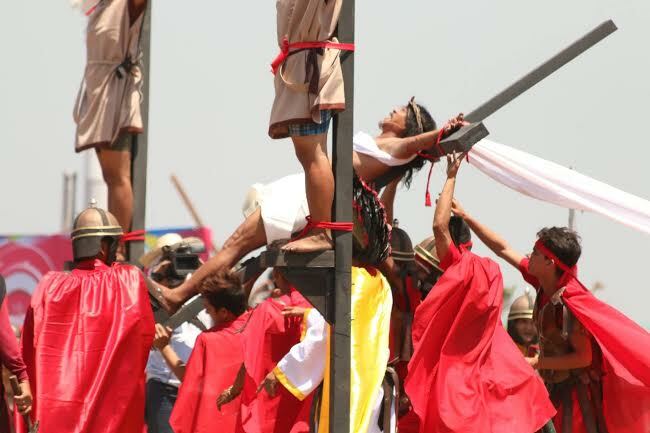 Not far from San Basilio is San Pedro, Cutud in San Fernando, Pampanga where they do a re-enactment of Christ’s nailing on the cross. Mostly male penitents were being nailed on the cross. This activity drew thousands of spectators, including foreigners and journalists. We were able to observe the actual nailing of one of the 13 penitents this year. The crucifixion is within a “cenaculo,” or a Lenten play. All performers wore colorful typical Roman gowns with matching swords and helmet for the soldiers. Many of us did not understand the language as the actors were speaking in their native dialect. Our anxiety grew as we anticipated the nailing on the cross. As the actor was propped on the cross, one of the soldiers cleansed his hands and feet with an alcohol to prevent any infections. The moment came when they positioned a stainless nail on the hand and a hammer prepared to strike. Unfortunately, our good view was blocked and I was not able to see the actual nailing but a loud yell came out expressing the pain he felt. It obviously was painful since at every stroke of the hammer, the actor raised his leg involuntarily probably showing the degree of pain. After they nailed both hands on the cross, soldiers erected the cross and nailed the foot. I believe the penitent had fainted since there was no movement when they nailed his feet on the cross. After the first penitent was nailed on the cross, spectators made their exodus and gave way to another set of viewers to witness the nailing of other penitents. 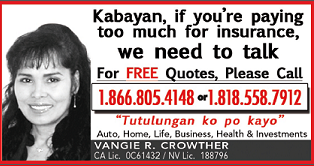 It’s still a mystery why many Filipinos are still doing this even as these were not sanctioned by Catholic Bishops. As with the other religious rituals I had covered, these practices continue to profess our peoples’ expression of sincere faith, many internalizing the pains that our Lord Jesus Christ felt or probably this represents a sacred agreement to cleanse one’s soul and refresh their faith once more.